Carthage Mills has partnered with Synteen and is now offering SF Series of SRW Geogrids that are manufactured from high-tenacity, high molecular weight polyester (PET) fibers in a full range of tensile strengths designed to meet the most demanding soil reinforcement applications; including Ultimate Tensile up to 29,750 lbs/ft. These Geogrids are woven in a stable, interlocking grid, placed under tension and polymer coated to provide excellent resistance to chemical and biological degradation within the pH range common to buried reinforcement applications. The special polymer coating on our SWR Geogrids also increases the dimensional stability of the product enhancing soil interaction properties and protecting against construction related installation damage. The ultimate design properties of Carthage Mills' SF Geogrids were carefully targeted by engineers who play an active role in the actual design and construction of segmental retaining walls. They provide the most efficient long-term design strengths (LTDS) in the industry. SUPERIOR LONG-TERM DESIGN STRENGTH (LTDS): Carthage Mills' SRW Geogrids feature exceptional long-term creep rupture performance. Combined with rugged resistance to installation damage and the durability of high tenacity PET fibers, SF Geogrids provide the most efficient design strengths available in the market. EXCELLENT SOIL INTERACTION: Carthage Mills' SF Geogrids deliver immediate tensile reinforcement to the soil or aggregate fill ensuring top performance of the reinforced structure. COST EFFECTIVE: Industry leading LTDS and interaction efficiency minimizes the number of geogrid layers required in the design. COMPREHENSIVE TESTING PROGRAM: Carthage Mills' SF Geogrids have been tested in accordance with the most rigorous standards of our industry ensuring credible data upon which the most demanding MSE designs rely. ROLL SIZES: Carthage Mills' SF Geogrids are available in standard 6' roll width allowing for easy shipping to, and handling at the project site. The standard 300' roll length is optimum for minimizing cut waste at the end of the roll. Carthage Mills' SRW Geogrids are also available in 12' and 17' wide rolls. 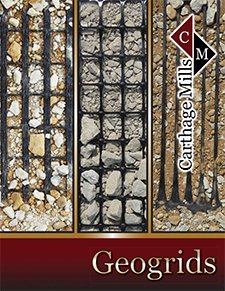 Carthage Mills' SF Series of SRW Geogrids are used in a wide variety of soil and aggregate reinforcement applications.